The Middle Point … The need for meditation is a spiritual need, necessary for awakening to your inner truth. Awakening requires your intelligence. Meditation requires your love. When love and intelligence come together in intimate relation with one another, they create the space for awakening to happen. The Middle Point is “unapproachable approach.” It’s the approach of the One-Self at the heart of everything. By taking this approach, you look at the world from the “beyond.” You find yourself in the process, the movement of “beyondness,” unfolding your ultimate truth in this moment, this point of now. 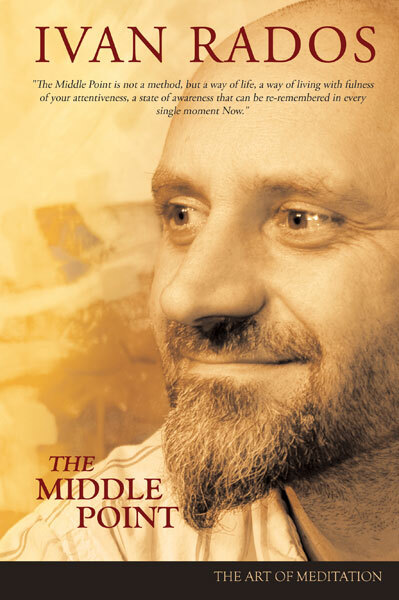 Amid today’s plethora of books offering familiar ‘spiritual’ platitudes, ‘The Middle Point’ stands out as a beacon of truth and insight. Ivan Rados does not recycle timeworn teachings or traditions, but speaks from the experience of his own living insight. This is not another set of beliefs to be learned, or a method to be followed; such things need to be let go as we are shown how to awaken to our true nature right now. What Ivan has to say may be very different to what you are used to from a spiritual book, but ‘The Middle Point’ is worth careful attention because it will guide discerning readers to experience truth for themselves. This book is not about New Age ‘Love and Light’ approach, nor Pseudophilosophical debate with the ego mind, nor the Cosmic Humanistic belief, but it is about a practical meditative application, informed by the understanding that we are individually and existentialy All That Is, the core source of everything. It is an approach of awareness – awareness of all subtle mechanisms of illusions and deceptions coming from the mind, to disconnect oneself from that illusionary entity, in order to attain the Truth. Ivan Rados describes the Middle Point, the obstacles confronting the practitioners and the means to overcome them. He offers his spiritual wisdom, advice and encouragement and leads the reader into a deeper meditation and our place within the wholeness. This is an essential book for those who are searching for the truth, health, and enlightenment. There exists no other books like it. It is a collection of meditation moments from Ivan Rados meditation discourses. It is a great gift for all of us – those who are on the path and those who aren’t. This book provides an essential foundation of Ivan’s meditation approach, “The Middle Point”, for all advanced meditation practices. “The Middle Point is grounded and nourished in non-dual reality as a single divine reality with ultimate awareness being its essence. The human experiences of separateness, and the temporality of time and space are projections produced by the dualistic mind.